My love of coral, turquoise and other bright and pastel hues are well documented on my blog and these shades are perfect in the form of nail polish for the spring and summer, however when the colder months draw in, I always feel the need to switch up my nail colour and opt for a more winter appropriate nail look. This winter season khaki, brown, grey and caramel shades are all going to be big. I am most excited about wearing grey nail polish shades as it is a much more subtle look than black and looks instantly sophisticated. 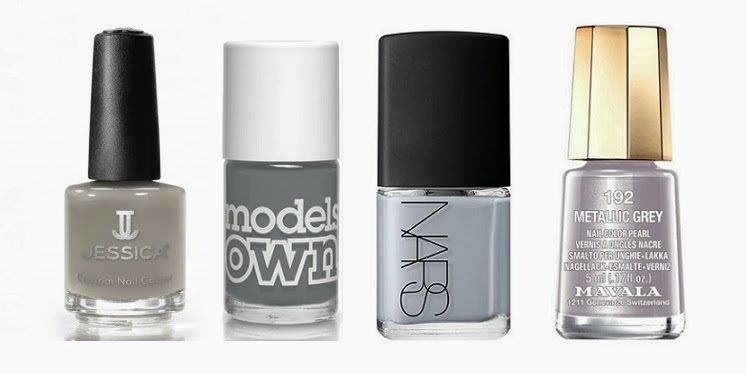 I’ve picked out some of my most favourite grey nail polishes to share with you all. Starting with Gerrard International that stock Jessica who are a brand of professional nail polish in a wide range of colours that are used widely in so many nail salons because they’re THAT good. My favourite grey from Jessica is a nail polish called Monarch which is a light grey with a crème finish. I love the colour because there isn’t anything harsh about it so it wont be too much of a stark contrast against my skin as I lose my suntan throughout the winter but at the same time, it will still look great against my tanned skin now– light, creamy polishes nearly always do. Jessica Nail Polishes are wax based so they provide a thick, high quality coverage and long lasting shine which I love! The nail polishes are also Vitamin A based so also help to nourish your nails which is a bonus, and for £9.75, this is a high performing polish with a mid price range that will keep your nails looking on trend all winter long. Another grey polish that I love is Misty Grey by Models Own that I reviewed many moons ago in this post. This is another light, creamy polish that is opaque in two coats. It is quite a girlie, feminine way to wear grey, just like Jessica’s Monarch however when I came to try to find a photo of it for you, I couldn’t find one where it was actually on sale, neither on the Models Own website nor on Boots. However there is a polish called Grey Day that looks suspiciously similar and equally as gorgeous as Misty Grey and at only £5 I think it’s definitely worth a swatch. For a slightly blue toned, lavender grey then Galathée by Nars is a beautiful option. At £14, this dove grey is a little more pricey than the other polishes here but I’d definitely part with the money for such a gorgeous looking grey. This one would be perfect when worn with an all black outfit with knitted grey accessories. If you’re someone who prefers metallic shades, or polishes on the other end of the price spectrum the Mavala Mini Colour Nail Polish in Metallic Grey is a fabulous option. This light, silver grey metallic polish will be the perfect addition to your winter nail collection and will look amazing throughout the party season when worn with a LBD or another sparkly party dress. Of course, if you didn’t want to paint your own nails, or if you wanted something with a little more lasting power than a traditional nail polish then you could visit a gel nails salon near you for a gel manicure that would remain chip free for a couple of weeks which is great, particularly for the Christmas party season, or for if you’re jetting off for a little winter sun. What are your favourite grey nail polishes?